This week I’m looking at vintage patterns showing sports of the Pan Am Games. (See the first post here.) Today: a pattern for gymnastics. McCall 6498 (1932) Gym & Dance Costume. 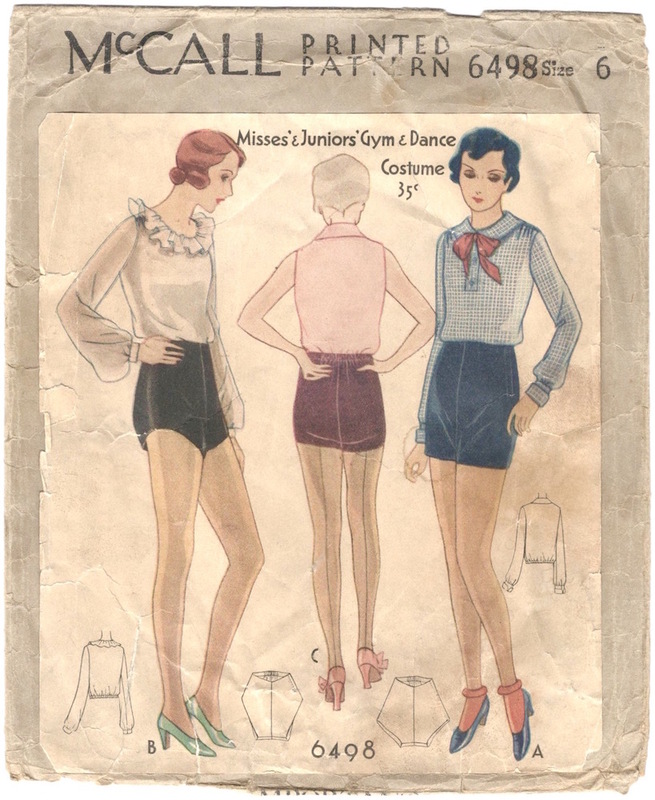 Like other sportswear patterns, McCall 6498 stayed in print for several years: Allison Marchant/carbonated’s copy is copyright 1934. I could definitely see these tap pants being worn under a skirt for dance. Actually if you make a blouse to fit precisely at the waist (not too long or short at any point) and finished it with elastic I think it would be quite a nice look, and make a change from stuffing all the excess into your skirt or trousers. It just makes me think of how important our modern stretch fabrics are for true sporting comfort. Ingenious, isn’t it? I love the tap pants, too — they always remind me of Ruby Keeler in 42nd Street. Isn’t it interesting how they’ve posed these dancer/gymnasts? Sort of unhappily fiddling with their upper-shorts-department.